Why do people put traffic cones on statues? 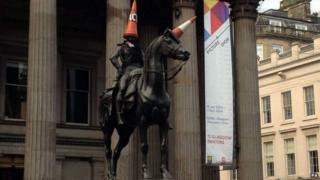 Glasgow council has ended plans to stop pranksters placing traffic cones on top of a statue of the Duke of Wellington. It's part of a long tradition of statue tomfoolery, says Finlo Rohrer. The placing of traffic cones on historic statues can be blamed on two factors - alcohol and the prevalence of roadworks of some kind in city centres. But two of the ancient world's most momentous events revolved around people messing about with statues. A diadem placed on a statue of Julius Caesar arguably started a chain of events that resulted in his murder and the beginning of the Roman Empire. The diadem was removed by two tribunes (depicted as Flavius and Marullus in the Shakespeare play) and then the trouble started. At the height of the Peloponnesian War between Sparta and Athens in the 5th Century BC, the Athenian general Alcibiades was recalled from a massive invasion of Sicily on charges of vandalising religiously significant statues of Hermes. He decided to defect to the Spartans rather than face the trumped-up charges. Command then passed to the less talented Nicias, the invasion was a disaster and the Athenians later lost the war. It's still not known who really smashed up the statues. In 2000, the statue of Winston Churchill in Parliament Square was memorably given a Mohican made out of turf. But the statue was also sprayed with graffiti - for which a former soldier was later imprisoned for 30 days. The same statue was again adorned in 2012, with a straitjacket on behalf on Channel 4, to publicise a series on mental health. Also last year, a series of statues across London were provided with hats by notable British milliners in a project linked to the Olympics. Some criticised that move as tacky and even compared it unfavourably with Glasgow's tradition. It's not just headwear in the form of cones or hats. AS Roma fan Enzo Giordani travelled New Zealand adorning random statues with scarves in the colours of his football team. And a charity in Norway did the same to distribute scarves to people in cold weather. In Trondheim in Norway, a statue of the city's founder Olav Tryggvason has occasionally been adorned with either a hat or a scarf. But bearing in mind that it's nearly 60ft from the base to the top of his head, one can only assume a degree of official complicity. And at least it's not a cone.